We bring you the traditional summary along with a few statistical facts. Shakhtar extended their clean-sheet run to 7 rounds. The Miners' record figure was 8 games in the 2001/02 season (including 3 autumn games under the leadership of Valeriy Yaremchenko and 5 spring ones under Nevio Scala). Solomon who made his second appearance in Shakhtar’s starting XI has won 11 of 16 duels (69%), being successful in dribbling (5/5), accurate in terms of passing (93%) and named Man of the Match. In the absence of Alan Patrick, Viktor Kovalenko had the central midfielder role in a pairing with Taras Stepanenko. The Shakhtar Academy graduate scored a goal and provided an assist. By the way, the scored goal is his 25th goal with the club and just his second spot-kick goal. In this match, Paulo Fonseca fielded Kayode as the attacking spearhead, with the top three attacking midfielders being Tete, Taison, and Solomon. 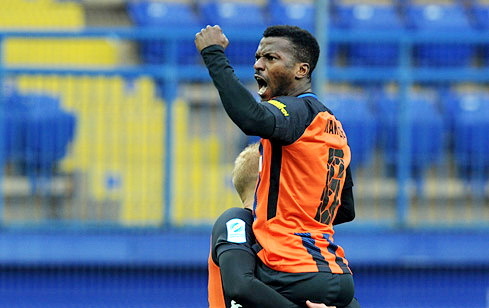 The Nigerian forward, for whom the game has been the 20th with Shakhtar, moved a lot, supporting the attacks from deep, keeping the ball and winning 67% of his duels, he fed the ball to his teammates on three occasions and netted one himself. The 19-year-old Tete, being the club’s most expensive signing in the winter transfer window, has made his first appearance in adult football. The debutant was active, dribbling more often than the rest (7 successful ones out of 8) and earned a spot-kick. The Zorya footballers fouled on the Brazilian 5 times. Coming on for Kovalenko, Maycon scored his 5th goal in the 30th appearance with Shakhtar. Interestingly, he always nets goals late in the halves (40-45; 81-90+). Shakhtar have played Zorya 99 times in Ukrainian championships (39 meetings).